Halloween isn’t just for kids. Adults and kids can still enjoy dressing up in fun costumes and eat creepy treats. Don’t forget about a special drink for your next Halloween Party. 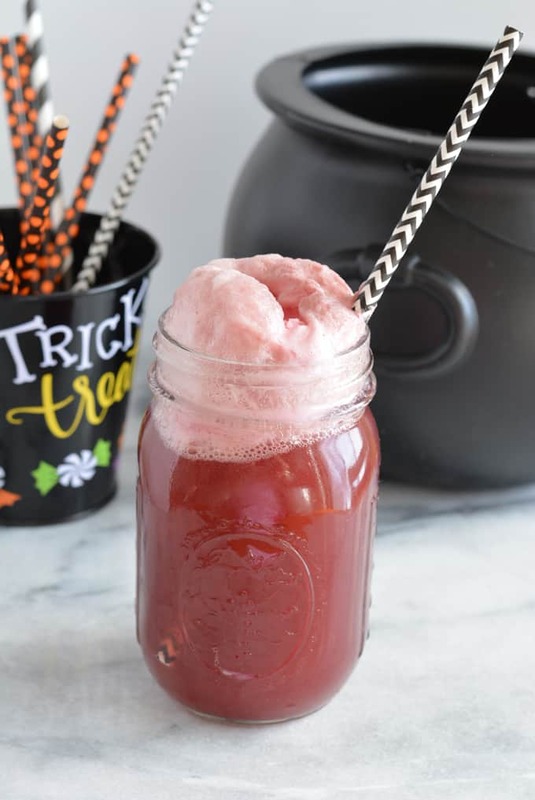 This Hocus Pocus Halloween Punch is kid-friendly and yummy too! My son is getting too old for trick or treating, but my daughter is still young enough to enjoy trick or treat. My hubby and I take turns either walking her around or giving out candy. Most years when Halloween is during the week it can be a bit of a challenge to coordinate the evening. One year when my husband got home late from work I left the candy bowl on the step so I could walk around with the kids. The bowl was completely empty when we got back, which wasn’t a surprise. I have never attended a Halloween party or hosted one myself. I usually just make Halloween treats for my kids before we head out for candy. Sometimes I make desserts, but they just get me in trouble. You know I can’t resist and end up eating too much. I stick to drinks, especially single serve because they are easier to control and they go with just about anything (even our mummy hot-dogs!). 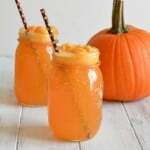 If you search on Pinterest you will find tons of Halloween punch and drink recipes. Many of the recipes are made with ingredients that contain artificial ingredients and/or colors. I don’t go crazy cutting out sugar (although I should), but I do avoid artificial colors as much as I can. 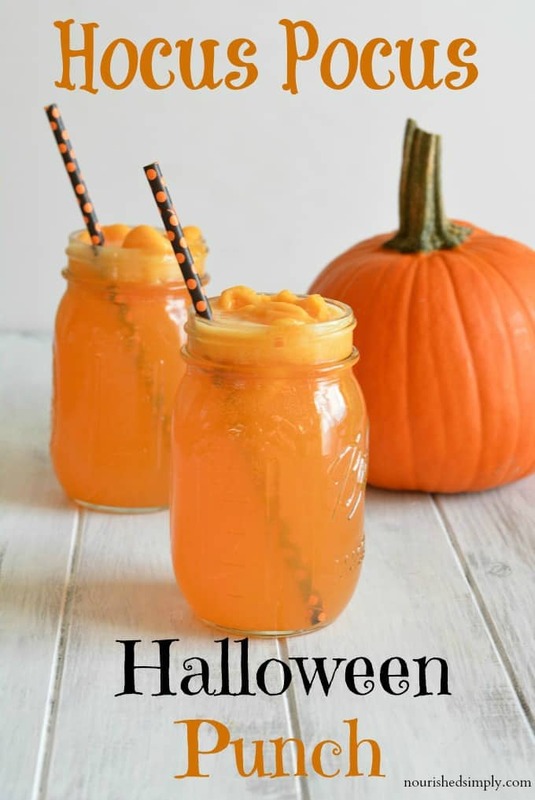 This Halloween punch uses ingredients that are colored naturally. To create a rich orange color you want to make sure the ingredients are all a similar color. If you don’t care for mango sorbet or can not find it orange sherbet works well. If you can not find Izze peach you could use Izze Clementine or orange soda. You can substitute Juicy Juice Orange Tangerine juice if you can not find V8 Splash. 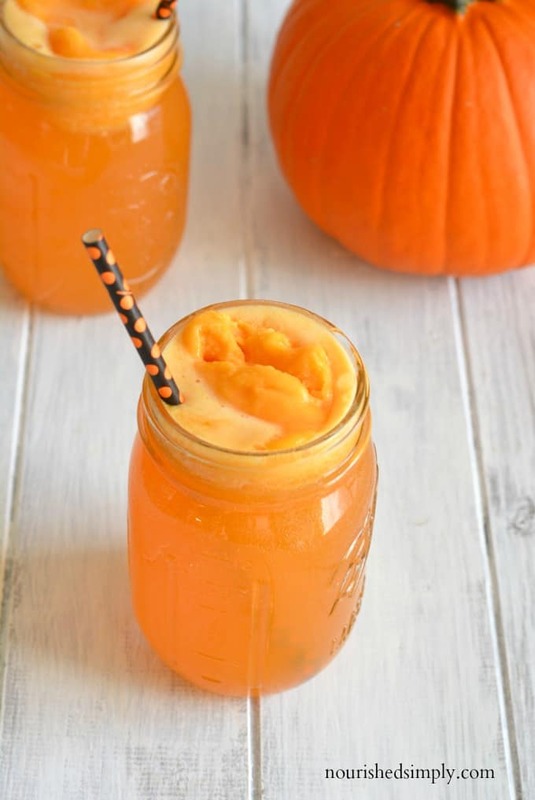 This kid-friendly orange Halloween punch is easy to make and free from artificial colors. 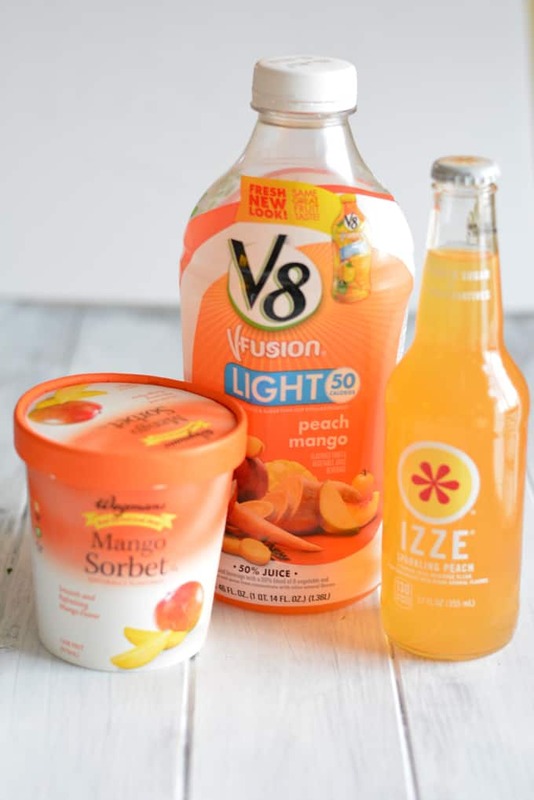 In a glass of your choice pour in V8, then Izze Peach. Top punch with one scoop of sorbet. 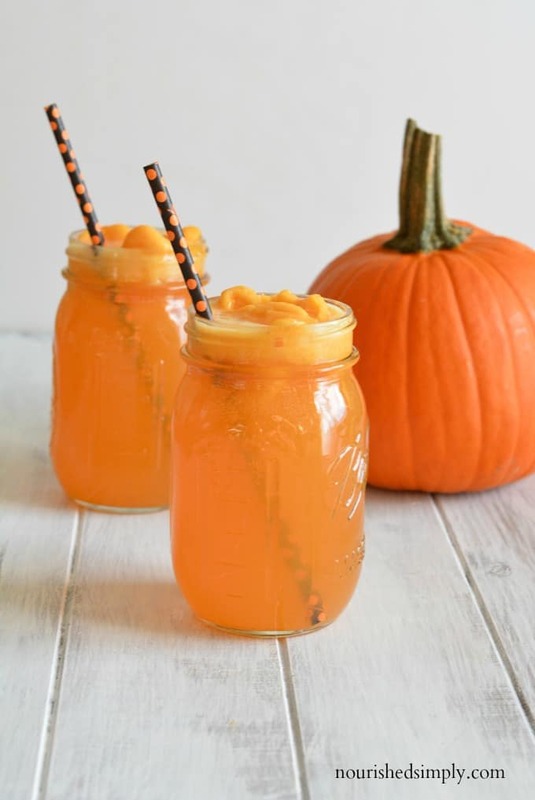 This Halloween punch is kid-friendly, but if you have had a rough night there is no reason why Mom and Dad can’t add a little something to their drinks at the end of the night! Love the COSTUME! And the drink. So fun – and great idea to use all those ingredients without artificial colors. Rocking that costume like a boss! This is my kind of Halloween punch, which may also include some vodka accidentally poured in! 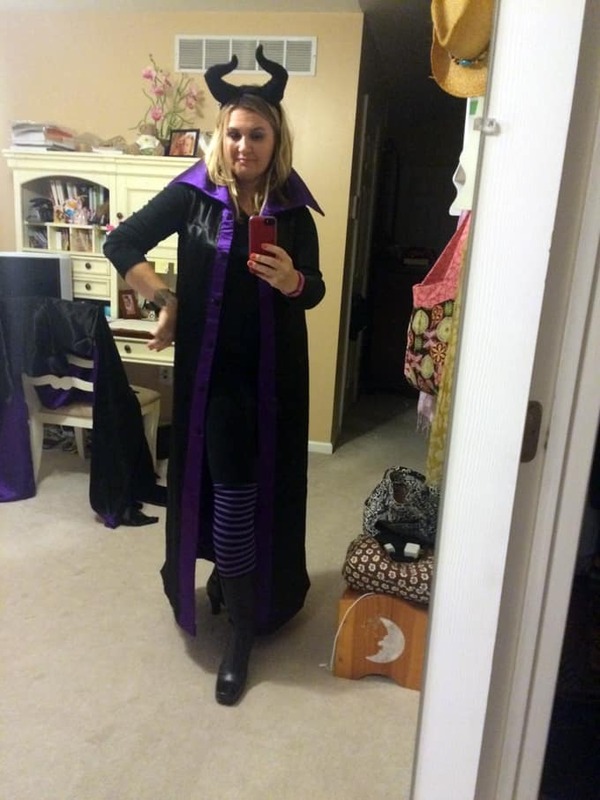 This year I have purple hair to go with my costume! Vodka would be awesome! So fun. Such good proof that you can make bright colorful party food to rival the artificial stuff and I’m sure it tastes 10 times better, too. Pinning! I hated to make that green punch last year, but that was my assignment. Never again. I totally agree halloween is not just for kids, I love it!! I think I get more excited than my kids. I think i”ll be so sad when my kids are too old for halloween. Though a halloween Bar Mitzvah would be amazingly fun (ay better than candy!) You rock that costume girl! Apparently there will be tons of candy at the Br Mitzvah. I my son to not feel well at some point. I love Halloween too! This looks so fun, festive and flavorful! So fun to dress up and be silly. Now that’s a punch I can get on board with! Can’t wait for Halloween!! Halloween is too quick, I agree! I’m sure he will get more than enough candy! I love your costume! I’m still trying to figure out what to be! It’s fun to get into the holiday! I love the natural orange color of the drink! It’s so festive, and much more appealing than the green drinks for sure! 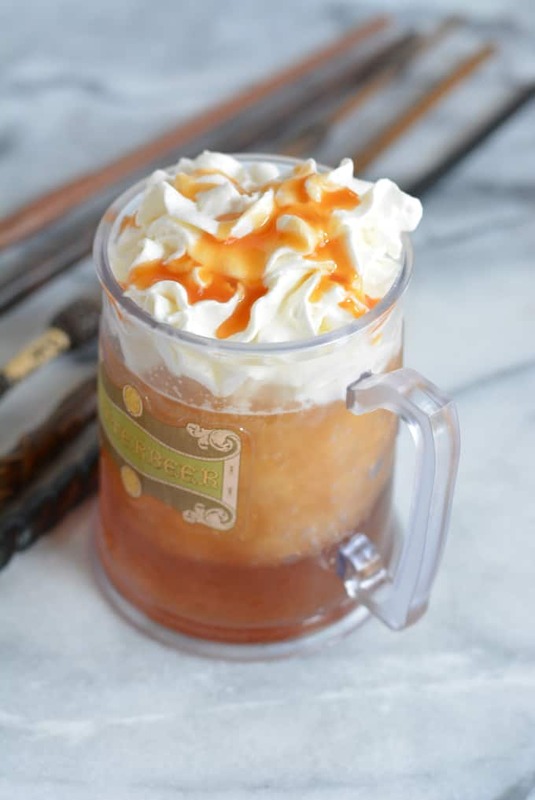 Do you think it would be possible to make this drink in a big punch bowl for multiple people? if so how would you do that, how much ice cream would you put in? I’m sure you could. Not sure how much ice cream though. I would try with just a few scoops and see how it looks.